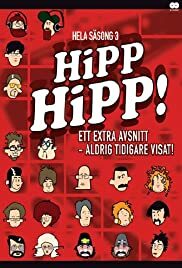 A Swedish sketch comedy show bordering on satire, absurdist and surrealism with socialist zombie outbreaks, refugee crisis musicals and the misogynist conspiracies of male comedians. An ancient Greek philosopher's comical vision of how life in present day Sweden will play out. Roy and Roger decide to close their gasstation for the summer, to try to find where, what and how their lost father is. Roger also falls in love and much more. Bumbling TV journalist find himself reporting from a coup d'etat in Africa. Itzhak Skenström: The people of Greenland has a thousand words for snow, but no words for war. The people of Finland however, has a thousand words for alcohol, but no words for consideration. I think that this show is so funny that it (if it were in America) should win an Emmy. I also think that Tiffany is the best thing in Hipp Hipp! Swedish for beginners can be helpful. Kajan is really scary. The low according to me is Itzhak Skenström. More of that drum-baby please. The radio-guy can be difficult to understand for none Swedish citizens. But Tony, Zunken and the weird brothers Micke and Mini rules the world.